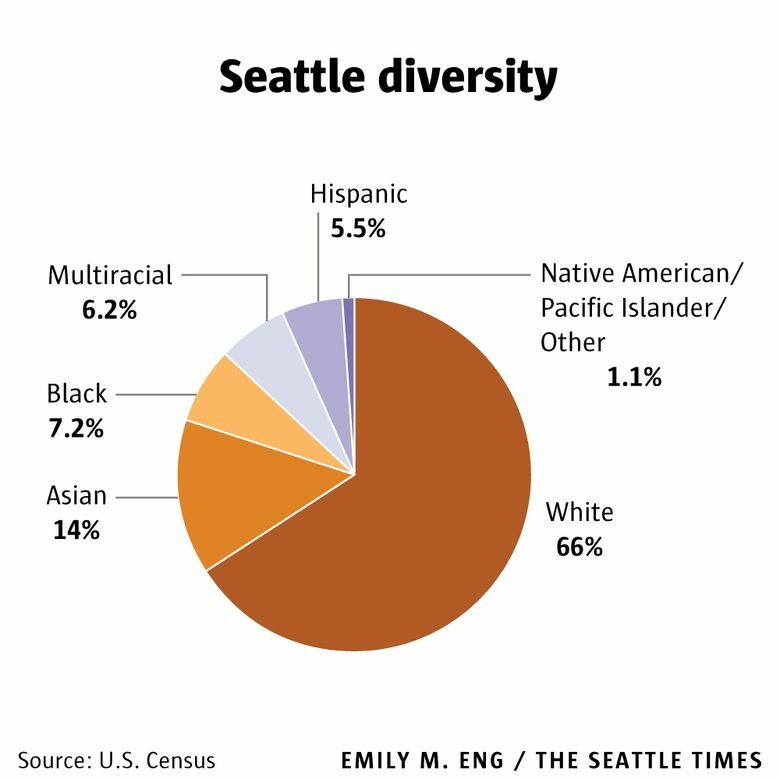 Seattle remains one of the least diverse large cities in the U.S., with whites comprising two-thirds of the population. But those overall figures obscure some dramatic demographic changes in neighborhoods like Capitol Hill and the Chinatown/International District. Seattle has experienced more change in the past five years than most places do in a generation or two. Those changes — from population growth to rising housing costs — have been frequent subjects of this column. But as dynamic as Seattle is, one thing has remained remarkably constant since the start of this decade: The city’s racial diversity. Even though there are 75,000 more people living here, a breakdown of the population by race and ethnicity looks pretty much the same. Two out of three Seattle residents are non-Hispanic whites, unchanged since 2010. The numbers for other racial and ethnic groups have also been stable. The percentage of multiracial people increased a bit, while there were slight declines for blacks and Asians — but these were incremental changes. Most other big cities have moved toward greater diversity since 2010. 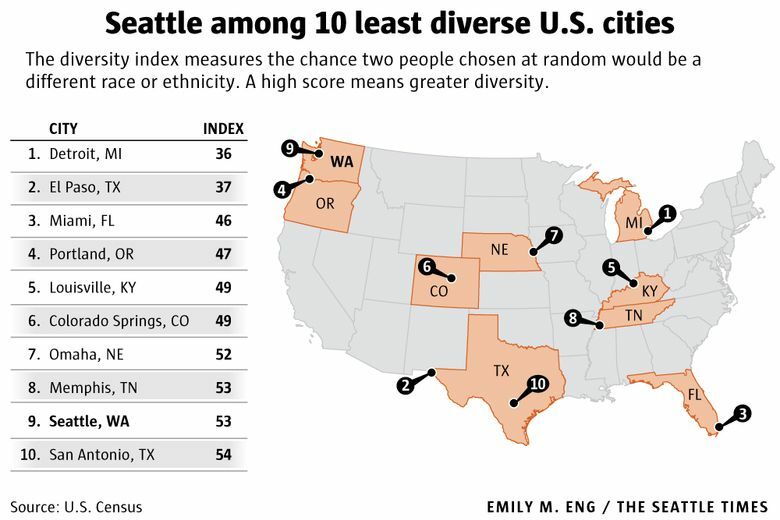 Because Seattle hasn’t, we now rank among the 10 least diverse major U.S. cities, according to a well-known measure of racial diversity. The lack of change in Seattle is in sharp contrast with the rest of King County, which has experienced rapid diversification in recent years. And as I reported last month, Bellevue just became Washington’s largest “majority-minority” city. But a variety of factors have helped overturn that. The high cost of housing in Seattle, for example, has pushed lower-income families — many of whom are people of color — to more affordable South King County. And the Eastside’s tech boom has drawn thousands of skilled workers from Asia to the other side of the Lake. I used a tool to measure Seattle’s diversity — it’s called the diversity index — which indicates the chance that two people chosen at random will not be the same race and ethnicity. The index is expressed as a number from 0 to 100. A high number indicates a very diverse population, while a low number means that a community is primarily made up of a single group. With a score of 53, Seattle ranks as the ninth least diverse major U.S. city, down from 11th in 2010. Detroit, where nearly 80 percent of the population is black, has the lowest diversity score — 36. Even if Seattle’s overall racial composition looks mostly unchanged from 2010, new census data reveals some dramatic shifts at the neighborhood level. The most rapidly diversifying area of Seattle, as it turns out, is one that has also been transformed by gentrification in recent years. In the heart of Capitol Hill, the diversity index jumped by 20 points. The white population in this census tract dropped from 83 percent to 68 percent. Asian, black, Hispanic and multiracial populations all increased here. Interestingly, another part of the same neighborhood moved in the opposite direction. The city’s second-biggest drop in diversity occurred in the tony North Capitol Hill area that surrounds Volunteer Park. Here, whites now make up 90 percent of the population, a 10 point jump. Only Georgetown saw a sharper decline in diversity, due to a decreasing number of Latinos. In four of the five Seattle neighborhoods that made the biggest gains in diversity, whites declined as a share of the population. But that’s not what happened in the Chinatown/International District, where a spike in housing development is drawing new folks to the neighborhood. An influx of both white and black residents helped bump up the diversity index here by 19 points. Meanwhile, Asians fell from 72 percent to 54 percent of the neighborhood’s population.